You are here: Home » It’s Spargel Season! It’s springtime and springtime means Spargel! Spargel is the “Austrian” term, (read: German) for the vegetable more commonly known to the US as asparagus. This isn’t any old asparagus, though, year-to-year European countries patiently await the arrival of freshly-grown, quality spargel… in particular the white variety! A slight wood note only for special recipes, such as Hollandaise, Polonaise, etc. Want to eat spargel like an Austrian? 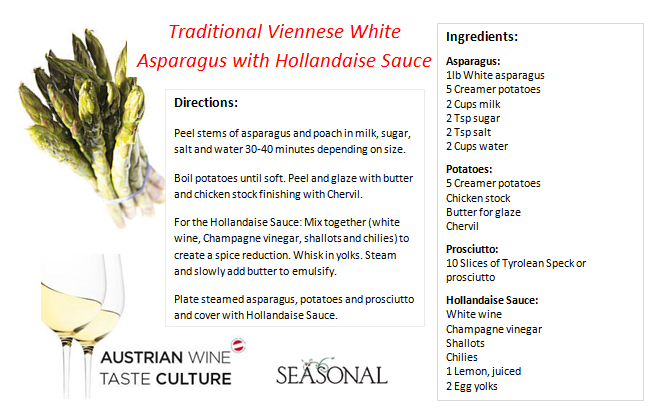 Check out this great recipe from Seasonal Restaurant and Weinbar’s Chef Wolfgang Ban…we simply can’t get enough!